Posted in Agencies, Immigration, News, under North America. Tagged with Brazil, Canada, international students. 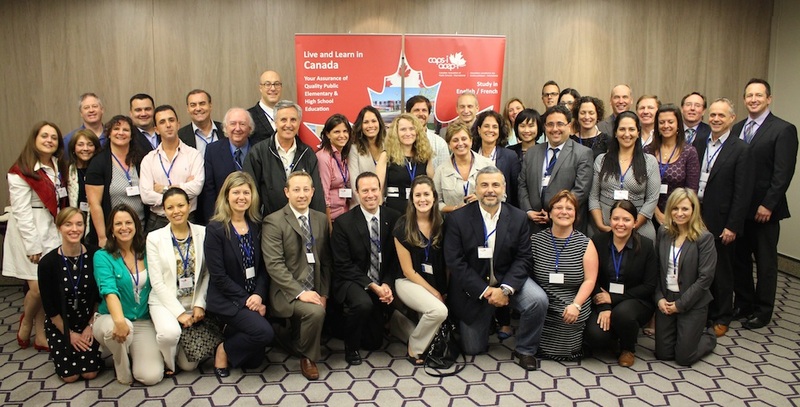 The Canadian Association of Public Schools – International (CAPS-I) has taken members from 33 school districts on their first trade missions to Mexico and Brazil, for a series of seminars and meetings with Latin American agencies. Group photo from Sao Paulo. Photo: StudentMarketing. "There is clearly strong, mutual interest in developing new relationships in both markets"
The missions were conducted in collaboration with student travel consultancy StudentMarketing, with the aim to increase the number of high school students coming from the region to study in Canada. Representatives travelled to Mexico City and Monterrey in Mexico at the end of February, and Sao Paulo and Belo Horizonte in Brazil two weeks ago, for market briefings held by Canadian embassy staff, and to attend seminars and formal meetings between schools and agency representatives. “We had more interest from both our member school districts and agency representatives wanting to participate in our recent events in Mexico and Brazil than we could accommodate,” said Bonnie McKie, executive director of CAPS-I. Seven per cent of Canada’s international students come from the Latin America and Caribbean region, with Brazil and Mexico having a 90% success rate in visa applications. Since the CAPS-I missions took place, organisers have confirmed that agreements have already been signed between the schools and local agency representatives in Latin America, and student applications are currently being filled.